It is possible in a single term undergraduate mineralogy course to complete a project involving the characterization and identification of mineral unknowns. These identifications are based on physical properties, unit cell parameters or d-spacings determined from powder X-ray diffraction scans, chemical composition determined on an electron microbeam instrument, and optical properties determined with a petrographic microscope. Each phase of the project is timed to compliment the sequence of concepts covered in mineralogy lecture and lab. Such a project serves to (1) illustrate practical applications of methods discussed in lecture; (2) illustrate the connection between mineralogy and topics covered in ancillary courses such as chemistry and physics; (3) pique the interest of some students for pursuing mineralogic and petrologic research projects later in their careers. Incorporating poetry in science teaching expands the curriculum beyond content knowledge or process skills and enhances learning in creativity and affective skills. A high school earth science teacher and a college education professor team-taught a lesson to ninth graders on using poetry to learn about minerals. The professor, a geologist, shared an electronic slide show of poems (Diamond and Tiger Eye are included in the article) she had composed about gem minerals that incorporated physical properties, formation, uses, and other information. After instruction, students researched a mineral of choice and wrote poems that contained facts and a personal reaction to the mineral. Students' most difficult aspect was finding words to express their ideas in rhyme. The most satisfying part was the sense of accomplishment in producing a scientific poem. About half of the students changed their perceptions of earth science as a result of mineral poetry exploration. Another benefit of the collaboration involved career education. Students commented that they now understood more of the job of a mineralogist and the passion one can bring to a subject through poetry. An effective undergraduate mineralogy course provides students with a familiarity and understanding of minerals that is necessary for studying the Earth. This paper describes our strategy for integrating the disparate topics covered in a mineralogy course and for presenting them in a way that facilitates an understaning of mineralogy that enables students to apply it in subsequent courses and research. Our strategy is to organize the course into a well-integrated sequence of lectures, demonstrations and laboratory exercises that unfolds the material logically and at at pace that is responsive to the students' needs. The course begins with six weeks on crystal chemistry, then five weeks covering analytical methods for characterizing minerals and ends with five weeks on the silicates. This order facilitates a progression of learning from the basic concepts to the more advanced and allows us to reinforce the concepts of crystal chemistry during the final section on the silicates. Optical mineralogy is almost entirely taught in the lab and is aided by the use of a mineral identification chart developed to help students learn to identify minerals in thin section. Student performance is assessed through one technical paper and presentation as well as homework, essay exams and lab practicals. Mineralogy is usually the first geology course taken by students above the 100 level, and as such it is a vital building block for geology curricula. In recent years the number of mineralogists has declined, the relevance of the field has been questioned, and as a result the course has often been taught by less than enthusiastic non-specialists in the field. We believe that the key to restructuring mineralogy involves setting reasonable, prioritized course goals and employing (at least) four modern pedagogical learning methods: spiral learning, inquiry-based learning, concept maps, and use of interactive models and visualization. We present here a revised mineralogy curriculum that benefits from reflections on appropriate content and on these new learning methods and teaching styles. I propose two alternatives to the traditional ball-and-stick model for teaching silicate chemistry and crystallography in the classroom. The first model uses fresh fruits of varying sizes to demonstrate the basic silicon-oxygen tetrahedral structure, and to show how covalent and metallic bonding can reduce the negative charge balance, ultimately creating viable silicate minerals. The second uses students to represent large mobile silicon tetrahedral in a truly hands-on approach to understanding silicate minerals and magmas. The tow methods used together and supplemented with active in-class discussion provide for optimal learning, even in large classes. The Polarized Light Microscope: Should we Teach the use of a 19th Century Instrument in the 21st Century? The polarizing light microscope (PLM) has no doubt contributed more to our knowledge of minerals and rocks than any other single instrument. Then why is the use of the PLM, and the teaching of optical mineralogy in general, decreasing? Probably one of the main reasons is educators seek to present the newest, most technologically advanced techniques and methods to their students. Also, the geoscience curriculum has changed to include environmental geology, essentially hydrogeology. However, in presenting these newer materials, or new courses, we must exclude something, and it appears that one of the things excluded is instruction in use of the PLM. Another possibility is the professors teaching these courses do not have an adequate understanding of optical mineralogy. Excluding the subject of optical microscopy will be the biggest mistake we ever make in the geosciences curriculum. This statement is justified because of the fundamentally important concepts presented in optical mineralogy: 1) three-dimensional visualization, 2) inquiry-based learning, and 3) hands-on use of an analytical instrument. No other single course in our curriculum provides so many of these fundamental skills to our students. An example of inquiry-based learning is determining the best technique to identify a mineral. For example, powder X-ray diffraction provides a diffraction pattern searchable in a database, but the result might not be correct. In the past 20-30 years, the spindle stage has allowed for more detailed single crystal studies than ever before. Optical techniques are also used to study such diverse mineralogical problems as cation-diffusion in zeolites and asbestos identification, or they may be incorporated into other areas of research, such as synchrotron experiments on oriented single crystals. Also, any serious petrologic study must begin with a thorough examination of the samples by PLM, before other types of characterization can proceed. A diversity of employment opportunities exist for students who are trained in use of the PLM, such as in the fields of forensics, material science, manufacturing, the food industry, medical technology, and the emerging field of environmental mineralogy. The increasing complexity of ores processed today necessitates more detailed mineralogical characterization than in the past. To ensure that metallurgists have the skills and knowledge required for this the Minerals Council of Australia is funding the preparation of curriculum materials for use in undergraduate and postgraduate courses in process mineralogy. Each course represents 75 contact hours of instruction and is being introduced progressively at universities in the Mineral Council's Australian network. Their modular format and appropriate use of WWW technologies mean the courses can be delivered to external students as well as those on campus. The undergraduate course adopts an active learning strategy with tasks written to "wrap around" established textbooks. Empahsis is on characterization of ore minerals and mill products. All students will develop basic skills in reflected light microscopy using a virtual polarizing microscope tutorial being prepared as a CD ROM. The postgraduate course develops understanding of sophisticated analytical techniques and their application: image analysis, advanced beam techniques for chemical analysis (including proton microprobe, dynamic SIMS, ICP-MS) and surface analysis.Case study material provides opportunities for students in both courses to study the application of mineralogy to problems in mineral processing and extractive metallurgy. This exercise for mineralogy/geochemistry course uses optical microscopy to measure the grain sizes of equant halite crystals, and the time for complete dissolution of each grain. The required equipment is readily available in most science departments: microscopes, thermometers, stopwatches, glassware, and table salt. Using hot plates, the procedure can be repeated at a second, elevated temperature, allowing determination of the temperature dependence (Arrhenius activation energy) of the reaction. The data generated are used in homework exercises, to calculate (1) a simple rate law for the dissolution of halite in pure water; (2) the rate of coefficient in that rate law, at two different temperatures; and (3) the activation energy of the halite dissolution reaction. The lab and homework illustrate several basic principles of chemical kinetics directly relevant to geology, including diffusion, the temperature dependence of reaction rates, and the relationship between rate-determining mechanisms and crystal-surface morphology. Optical mineralogy is a subject firmly integrated into geoscience programs that offer mineralogy and petrology modules. Polarized-light microscopy remains a powerful and cost-effective analytical method, both at the educational and the professional level. It is the ideal analytical tool for the teaching laboratory. Virtually any petrographic work that does not specifically require electron-microscope-scale analysis involves an optical microscope, whether in conjunction with other analytical equipment, or not. However, changes in the perspectives of geoscience education and the necessity to accommodate students with interdisciplinary interest alongside those who opt for a classic geology degree create a neeed for an optical mineralogy course that is concise, but still meets the demands of subsequent course modules that build on it. 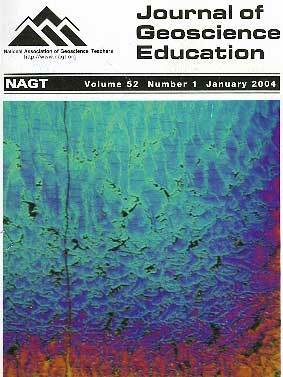 There is a range of resources that we can make use of to maintain reasonably high levels of theoretical and practical skills in polarized-light microscopy, such as application-focused lab materials and practice-oriented teaching with a strong interactive component, as well as computer-based teaching aids. Learning (memorizing) mineral formulae and analytical techniques and procedures can represent two of the more odius tasks facing students in Mineralogy courses. Yet, familiarity with mineral formulae facilitates the assimilation of many concepts dealing with mineral structures, coordination, and element substitutions, in addition to setting a context for geochemical problems encountered in other courses. Likewise, familiarity with a range of analytical techniques and equipment can open the door for valuable undergraduate research experiences, and lead to success in obtaining increasingly analytical entry-level jobs in geoscience-related fields. In-class discussion and flexible assessment schedules substantially improved retention of mineral formulae from one semester to the next, as opposed to other methods of "learning." Students are given the opportunity to "take control" of their course grade by having the option of retaking mineral formulae quizzes, at the same time increasing short-term utility and long-term retention. In-class discussions and concept mapping of formulae were used to help students develop a context for the use and meaning of formulae. An inquiry-based approach to the learning of analytical techniques and equipment allows students to experiment with various aspects of the analysis of minerals. Precision and accuracy, sample preparation, pitfalls and shortcuts, in addition to the most efficient way of implementing the equipment are best discovered by trial-and-error. Students are assigned a piece of equipment or analytical method and must develop a Standard Operating Procedure (SOP) based on their understanding of the equipment. Presentation of their SOP facilitates discussion on similarities and differences, while introducing the entire class to a wide range of procedures. The American Mineralogist Crystal Structure Database is a compilation of every crystal structure potentially of mineralogic or geologic interest. The database, seen as an outreach service, is funded and maintained by NSF, the Mineralogical Society of America and the Mineralogical Association of Canada. This database, when linked with visualization software, provides an invaluable resource for instructors, allowing direct access to crystal structures of almost any mineral, and many at various compositions, pressures or temperatures. Associated with the database is a freeware visualization program, XtallDraw with ancillary software modules, Xpow (for visualization of powder diffraction patterns) and SPEEDEN (for visualization of electron density maps). These software modules are user-friendly, allowing students, instructors, and researchers to easily access various crystal structures. Suggestions for using the database and software in an instructional setting are given; full lesson plans and instructional guides are being developed as Internet resources. Mineralogy is commonly the first difficult geology course that a student major encounters. To provide a solid foundation and context for learning mineralogy, and, in an effort to enhance retention of information and facilitate learning, the 'typical' sequence in our mineralogy course is restructured using the whole Earth as a reference framework. This method provides a context in which to teach the materials that comprise our Planet. Beginning with the Earth's core, simple native elements are introduced, followed by minerals with increasing complexity as discussion moves outward to the Earth's crust. Key theoretical concepts are seamlessly interwoven into discussions of various portions of the Earth, rather than being considered initially in a separate section. This flexible framework allows individual courses to be tailored to the needs of the department while maintaining a strong tie to geology and establishing links to societally-relevant issues. Mineral museums are gradually changing their passive, traditional displays with more interactive, attractive, and informative forms of education. Museums are usually considered to provide informal learning opportunities, but projects can be designed to cover the whole range of formal, specialized, or even hidden curricula. To be effective, education in museums must be underpinned by curriculum developments; a sound collaboration with partners from the formal system being essential. Educational projects are also aimed at increasing and diversifying the role of the museum, increasing access and maximizing inclusivity for audiences of all learning levels, from pre-school to post-graduate, and for varied target-groups: families, individuals, schools & college groups, and adults. As a consequence, the role and the public exposure of the curator in modern mineral museums are broadening. The most common forms of educational activities in mineral museums include: traditional exhibitions/displays, "hands-on" galleries, behind-the-scenes tours, formal lecturing, working with the "enthusiasts", field-trips & sampling campaigns, outreach collections, articles in popular journals, editing of educational materials. We hope that examples of specific projects implemented by our museums will demonstrate how sensibility, mystery, or even fun is also essential.